Oceanfront condo with an outstanding ocean view from the 2nd floor - end unit! Nicely appointed, 2 Bedrooms and 2 bathroom condo. Located in A Place at the Beach condo complex with oceanfront swimming pool. Central Heat/Air, television, dishwasher, microwave, ceiling fans throughout, and Washer/Dryer in unit. Enjoy the view from the furnished private sundeck situated perfectly to enjoy beautiful Carolina sunsets from this south facing beach. NON-SMOKING and absolutely NO PETS ALLOWED. 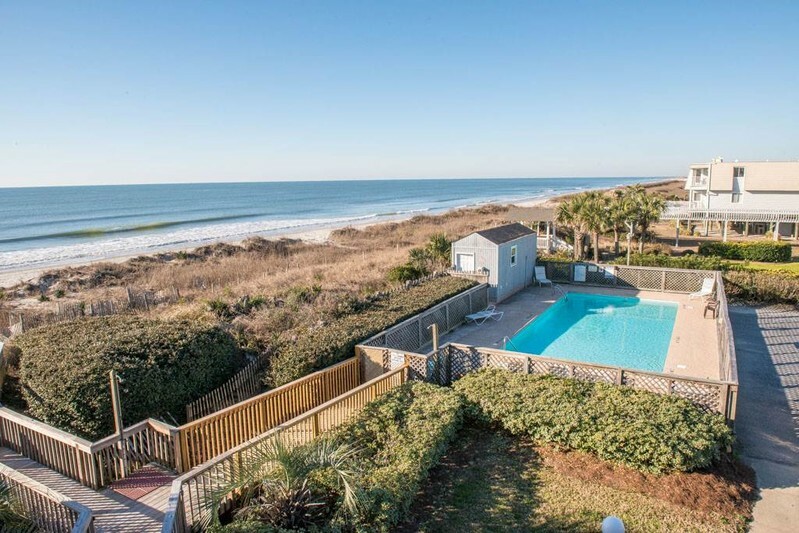 Place at the Beach Condominiums are located on the western end of Ocean Isle Beach and share a private oceanfront swimming pool access and walkway to the beach. Wireless Internet Access. Sleeps 4. Queen, 2 Singles Blue Ribbon; all beds will be made and towel sets provided for 4 guests.